"Degas is famous for his paintings, sculptures, prints, and drawings. He is especially identified with the subject of dance; more than half of his works depict dancers. He is regarded as one of the founders of Impressionism, although he rejected the term, preferring to be called a realist. He was a superb draftsman, and particularly masterly in depicting movement, as can be seen in his renditions of dancers, racecourse subjects and female nudes. His portraits are notable for their psychological complexity and for their portrayal of human isolation. Degas's work was controversial, but was generally admired for its draftsmanship." French painter and sculptor (1834–1917). 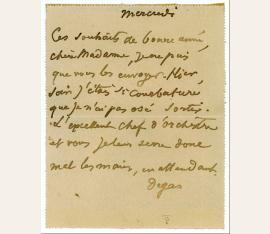 Autograph letter signed („Degas“). Paris. 8vo. ¾ p. on double leaf. 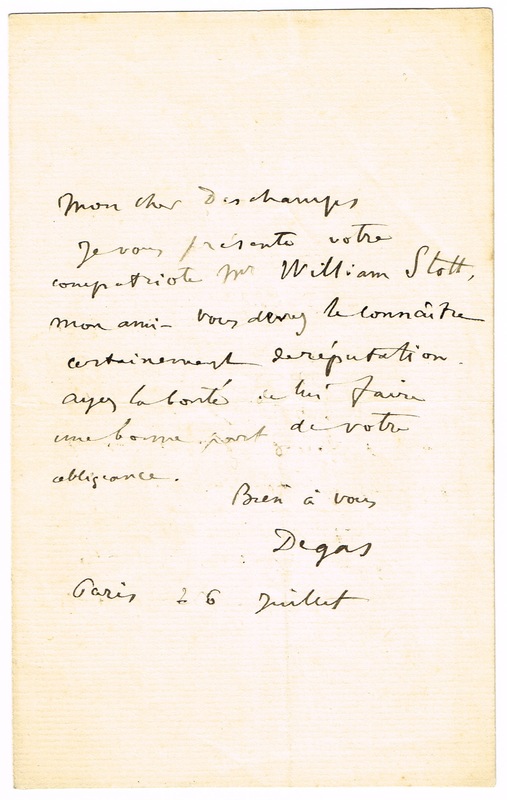 Letter of introduction to Charles Deschamps, manager of Paul Durand-Ruel’s London art gallery: „Je vous présente votre compatriote Mr William Stott, mon ami. Vous devez le connaître certainement de réputation. Ayez la bonté de lui faire une bonne part de votre obligeance“. – By the late 1880s, Degas had already received international recognition as an important artist. 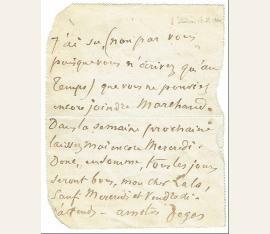 In this letter, he introduces the burgeoning British painter William Stott-of-Oldham to Charles Deschamps, manager of the Galerie Durand-Ruel et Cie in Paris. Exhibiting Impressionist works at his own galleries despite critics’ initial resistance, dealer Paul Durand-Ruel essentially created the market for Impressionism, establishing the biggest names in the movement, including Degas, Manet, Monet, Pissarro, and Renoir. A good word from one of his highly respected artists had the power to make a newcomer’s career, and it did just that for Stott. In 1889, he held his first one-man show at the Galerie to great critical reception, pushing him into the international art world. The established artist speaking out on behalf of an up-and-comer, this is a wonderful note involving three major figures in art history. – A light vertical fold through first letter of signature, a uniform shade of toning, a bit of trivial soiling, some stray ink flecks and a couple words a bit light due to decreased ink flow, otherwise fine condition..
peintre (1834-1917). Billet autographe signé à un ami. s.l.s.d. Oblong 8vo. 1 page. French painter and sculptor (1834-1917). 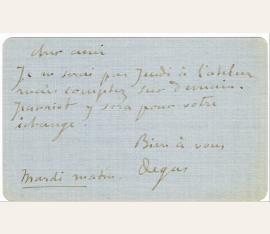 Autograph letter signed („Degas"). [Paris. 8vo. 1p. 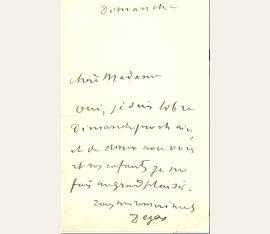 Card letter with autogr. address. 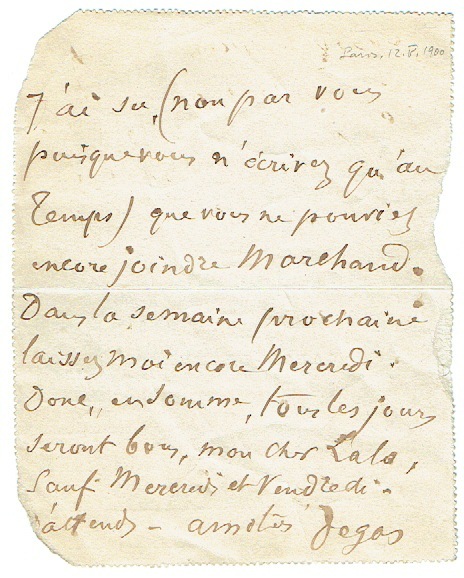 To Monsieur Lalo in Paris, on an appointment and a meeting at Marchand: „J’ai su, (non pas vous puisque vous n’écrirez qu’au temps) que vous ne pourriez encore joindre Marchand. Dans la semaine prochaine laissez moi encore Mercredi. Donc, en somme, tous les jours seront bons, mon cher Lalo, sauf Mercredi et Vendredi. [J]’attends. 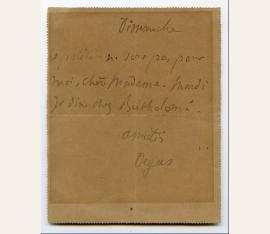 Amitiés | Degas“. Maler und Bildhauer (1834-1917). 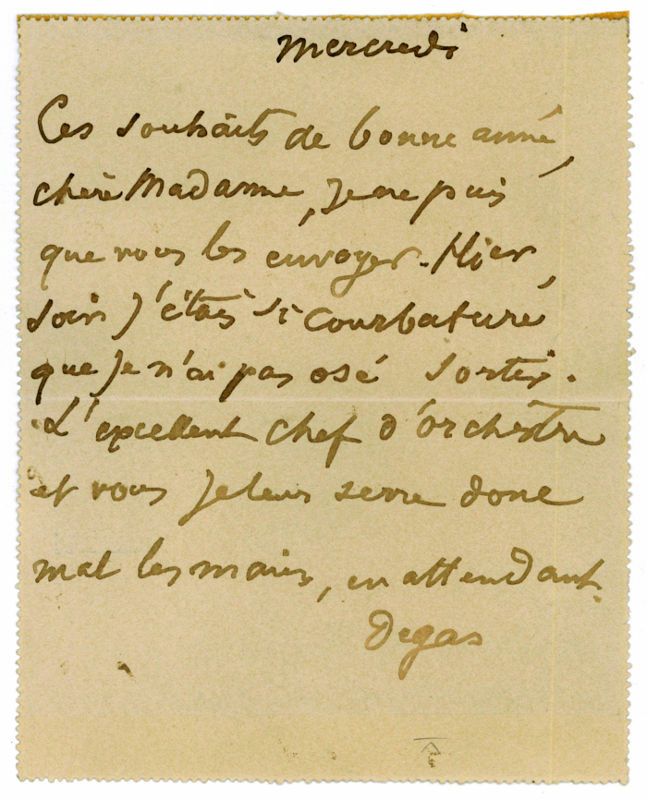 Autograph letter signed ("Degas"). N. p. o. d. 8vo. 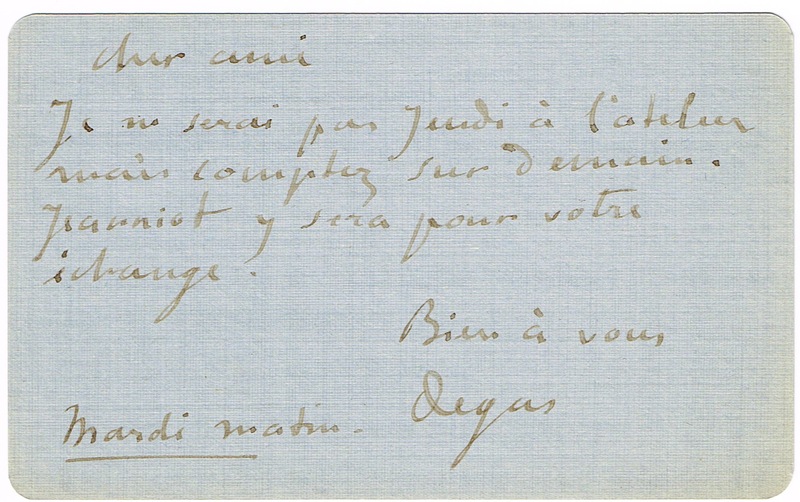 1 p.
To an unknown recipient, wishing a happy new year and stating that health problems prevented him from joining them that evening: "Ces souhaits de bonne année, chère Madame, je ne puis que vous les envoyer. Hier soir j'étais si courbaturé que je n'ai pas osé sortir […]". - Small traces of mounting. Maler und Bildhauer (1834-1917). 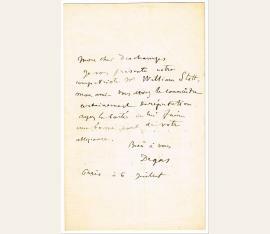 Autograph letter signed ("Degas"). O. O. 4 SS. auf Doppelblatt. 8vo. To the writer and journlist Maurice Talmeyr (1850-1933): "Oui, il y a longtemps que je n'ai entendu les accents saccadés de votre bonne voix. Ma bonne me les lit quelquefois dans le Gaulois, mais ce n'est pas vous […]". - The addressee's name in the salutation as well as in the text blackened with ink; with two small cracks in the center crease. Edgar Degas (1834–1917), Maler und Bildhauer. E. Brief mit U. („Degas“). [Paris, November 1893]. ¾ S. Kl.-8°. Mit e. Adresse (Kartenbrief). – An die Gattin seines Freundes Clermont mit der Mitteilung, daß der Kürbis nicht für ihn sei: „[...] Mardi je dine chez Bartholomé [...]“. – Mit dem Bildhauer Paul Albert Bartholomé (1848–1928) zusammen hatte Degas u. a. drei Jahre zuvor eine Reise von Burgund nach Paris unternommen. – Stark gebräunt und etwas lichtrandig; die Adreßseite mit kleinen Montagespuren. 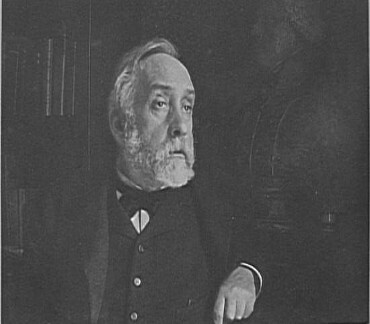 Edgar Degas (1834–1917), Maler und Bildhauer. E. Brief mit U. O. O. u. D. („Dimanche“). 1 Seite auf Doppelblatt. 8°. – An eine Dame mit Dank für eine Einladung für kommenden Sonntag; gerne wolle er kommen und mit ihr und ihren Kindern speisen.